It’s not typical. To quote a past advertising campaign from a completely unrelated product, “It’s miles away from ordinary.” What are we talking about? It’s the 2019 Alfa Romeo Stelvio, of course. This unique SUV offering from the legendary Italian automaker combines stunning good looks, incredible performance, and cargo/passenger friendliness all in one package! No matter which trim level you end up going with, you can count on getting all-wheel drive with the 2019 Stelvio. That’s right. With this SUV, you’re backed by the confidence and capability of all-wheel drive when you navigate the roads in and around Dulles and Arlington, VA. You’ll also benefit from a massively powerful engine under the hood of the 2019 Stelvio no matter which trim you go with. What else would you expect from a sport utility vehicle that’s engineered and designed by a company with the racing pedigree of Alfa Romeo? Why not head down to Safford Alfa Romeo today and experience the 2019 Alfa Romeo Stelvio for yourself. We have an amazing selection of Alfa Romeo models to choose from along with some outstanding purchase and lease specials. If you’re a first-time shopper of the Alfa Romeo brand, let our knowledgeable product specialists give you all the details on what makes these vehicles so special. We’re conveniently located at 8448 Leesburg Pike Unit A Vienna, VA 22182. One of the most attractive aspects of the 2019 Alfa Romeo Stelvio is the number of available features and amenities you get. That includes customized style options like your choice of black, red, or chocolate interior trim. There is also an amazing amount of technology and entertainment options available with the 2019 Alfa Romeo Stelvio. That includes some of the latest and greatest driver assistance features on the market like Forward Collision Warning Plus, Adaptive Cruise Control, and Blind Spot Detection. The large 8.8-inch touchscreen inside the cabin of the 2019 Alfa Romeo Stelvio also offers the very popular Apple CarPlay and Android Auto functions which allow for easy integration of your favorite apps onto the touchscreen. Make no mistake about it – the 2019 Alfa Romeo Stelvio’s exterior style definitely stands out from the other SUVs and crossovers on the roads of Virginia. It’s muscular, yet sleek, and even looks fast! The 2019 Alfa Romeo Stelvio comes standard with a 2.0L I4 turbocharged engine that is capable of generating 280 horsepower and 306 lb-ft torque. That engine configuration also comes with an eight-speed transmission system and, as noted earlier, every 2019 Alfa Romeo Stelvio comes standard with the Q4 all-wheel drive system. 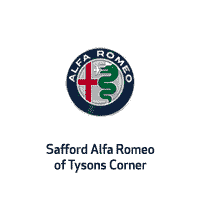 Why Pick Safford Alfa Romeo of Tysons Corner? In addition to our great selection of new Alfa Romeo vehicles, you’ll also find a team of experts who are intimately familiar with the brand and all its unique benefits. Alfa Romeo models are automotive masterpieces and our product specialists love “talking shop” with customers and highlighting all the benefits of the brand. If you’d like a more personal and in-depth car shopping experience, we strongly urge you to visit our Vienna, VA dealership today. We’re ready to get you into the new or pre-owned vehicle you want and help you get a great deal at Safford Alfa Romeo of Tysons Corner.